Everton Park is a suburb of Brisbane, Queensland, Australia. 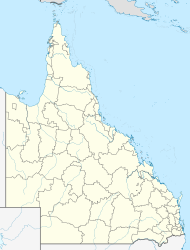 It is about eight kilometres north of the Brisbane CBD. This suburb is predominantly residential, with more than a quarter of the population residing in semi-detached and higher density dwellings. Everton Park is a Neighbourhood Watch area. The Ferny Hills Progress Association also document some of the early history and Jim Lightfoot's work that documents early Everton Park history including the early Everton Park Postal service. A more recent book is available called "From Bunyaville to Beyond" that chronicles the history of Everton Park and was created as part of Brisbane's Q150 celebrations. The Everton Park Library opened in 1965. In the 2011 census the population of Everton Park was 8,325 people: 51.2% female and 48.8% male. The median age of the Everton Park population was 37 years of age, the same as the national median. 77.5% of people living in Everton Park were born in Australia, compared to the national average of 69.8%; the next most common countries of birth were England 2.7%, New Zealand 2.4%, India 1.1%, Italy 0.9%, Scotland 0.8%. 85.9% of people spoke only English at home; the next most popular languages were 1.6% Italian, 0.6% Cantonese, 0.5% German, 0.5% Mandarin, 0.4% Hindi. Local schools include Everton Park State High School, Everton Park State Primary School, Northside Christian College and Prince of Peace Lutheran College. Everton Park State School was opened on 18 June 1934. 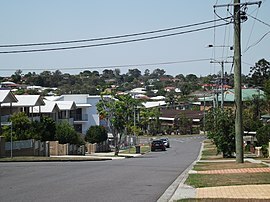 South Pine Road and Old Northern Road, are both major transport corridors, that run through the suburb, towards Brisbane. They are serviced by several Brisbane Transport bus services. Many commuters also drive or cycle to nearby train stations at Gaythorne, Mitchelton and Oxford Park. There are also many local bikeways. The Qld Department of Transport and Main Roads plans to provide new transit lanes on Stafford Road between Everton Park and Kedron and a new bikeway that would provide a direct east-west route along Stafford Road, between Everton Park and Kedron. The overall plan is to improve east-west capacity connecting the north-western suburbs with the Australian TradeCoast. On the day of the 2011 census, 15.6% of employed people travelled to work on public transport and 62.0% by car (either as driver or as passenger). Nearby Mitchelton, contains Brookside Shopping Centre, the major retail centre of the area, however, several retail services are available along South Pine Road, including the North-West Homemaker Centre, which includes the only Spotlight and Harvey Norman in the north-west district. A community-based shopping centre with a Coles supermarket and specialty stores is also located at the intersection of South Pine and Stafford Roads. The Brisbane City Council operates a public library at 561 South Pine Road. Tim Mander is the current sitting member of the Legislative Assembly of Queensland for Everton, having been elected at the 2012 Queensland state election by defeating Labor's Murray Watt (the Parliamentary Secretary to the Treasurer). ^ Australian Bureau of Statistics (27 June 2017). "Everton Park (State Suburb)". 2016 Census QuickStats. Retrieved 13 April 2018. ^ "McDowall Ward". Brisbane City Council. Brisbane City Council. Retrieved 12 March 2017. ^ "ABS Census 2011". Retrieved 20 January 2013. ^ Brisbane : Australia Post, "Everton Park Post Office. ; Postal service - Queensland - Everton Park - History. ; Everton Park (Qld.) - History", Jim Lightfoot, 1977? ^ "Public Libraries Statistical Bulletin 2016-17" (PDF). Public Libraries Connect. State Library of Queensland. November 2017. p. 11. Retrieved 29 January 2018. ^ Australian Bureau of Statistics (31 October 2012). "Everton Park (State Suburb)". 2011 Census QuickStats. Retrieved 25 October 2013. ^ "Project 8: Everton Park to Kedron Stafford Road transit lanes + Stafford Road Veloway". Western Brisbane Transport Network Strategy. Qld. Department of Transport and Main Roads. Retrieved 9 April 2012. ^ "Everton Park Library". Public Libraries Connect. State Library of Queensland. 15 December 2017. Retrieved 29 January 2018. "Everton Park". BRISbites. Brisbane City Council. Archived from the original on 20 July 2008. "Everton Park". Our Brisbane. Brisbane City Council. Archived from the original on 22 February 2008.